As a self-confessed fast-fashion addict, fabric is something I’ve often, and regrettably, neglected. While it’s sometimes part and parcel of being a style blogger – picking up inexpensive items for a quick turn-around of looks – it’s also something that has me yearning for a luxury. To slip on a piece of clothing and really feel the beauty of the fabric is something I treasure when those pieces come to my attention. Which brings me perfectly to the Lauren Silk Shirt I’m wearing in these images. Made from 95% silk, this is a piece that feels like heaven on the silk; a glossy wash of black fabric that sits perfectly tucked both in and out. Black shirts are back this season but this is also a classic that you’ll never stop wearing. As I’ve talked about in some of my recent posts, and as I’m sure translates to my Instagram grid, I’m heading firmly back to classic pieces and tones after a brief flirt with colour. Yes, trend pieces are important to add a bit of sass into your wardrobe every now and then, but staple pieces are the glue that holds your closet together; get the essentials and you’ll have friends for life. Not only does Winser London focus on the quality of clothing, but also the wearability of their items. I challenge you to pick out any piece of their collection and not be able to find multiple ways to wear it. 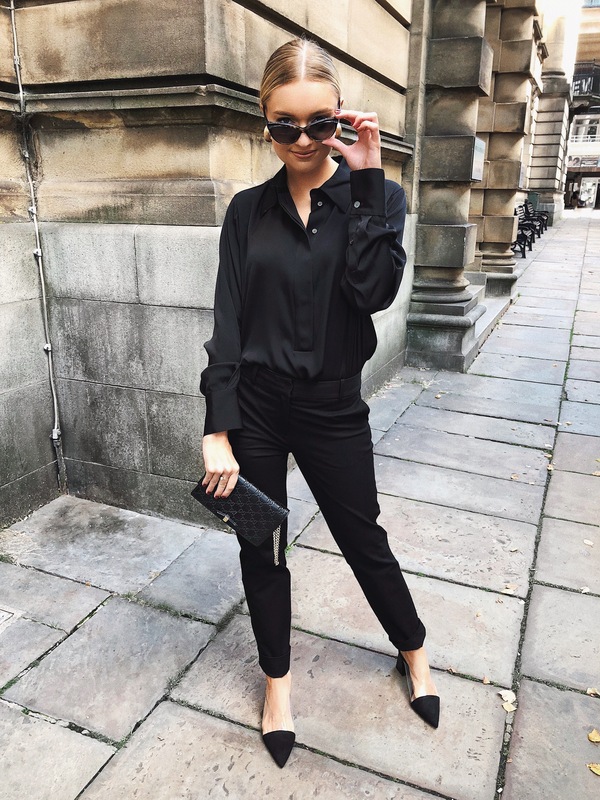 It’s a collection of clothes that bring confidence to its wearer; a pair of Italian Fabric Classic Trousers instantly flatters the figure and whilst also feeling easy and comfortable to wear. An award winning combination? I think so. This post is in sponsored collaboration with Winser London.